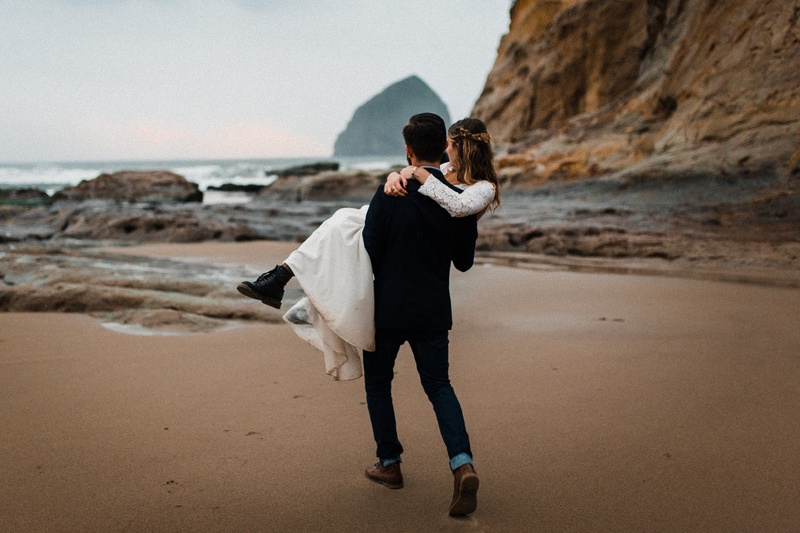 Oregon elopement planning can be hard. Why? 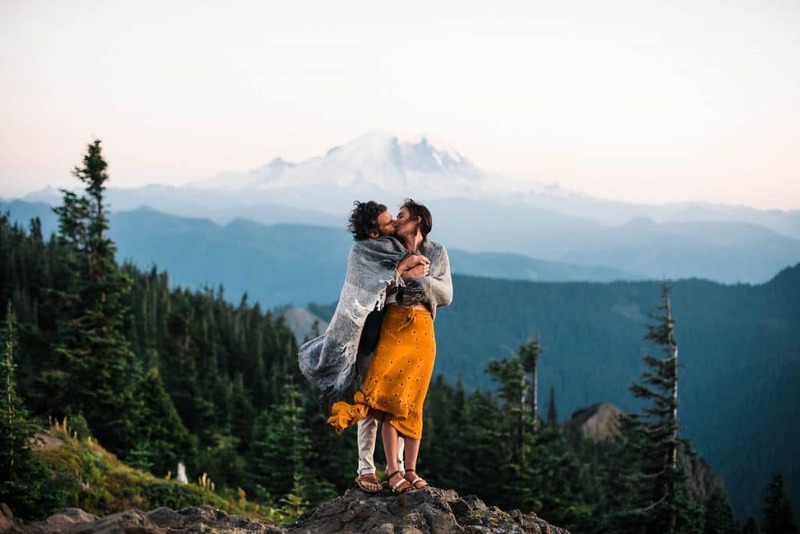 Because there so dang many gorgeous places to elope in Oregon! 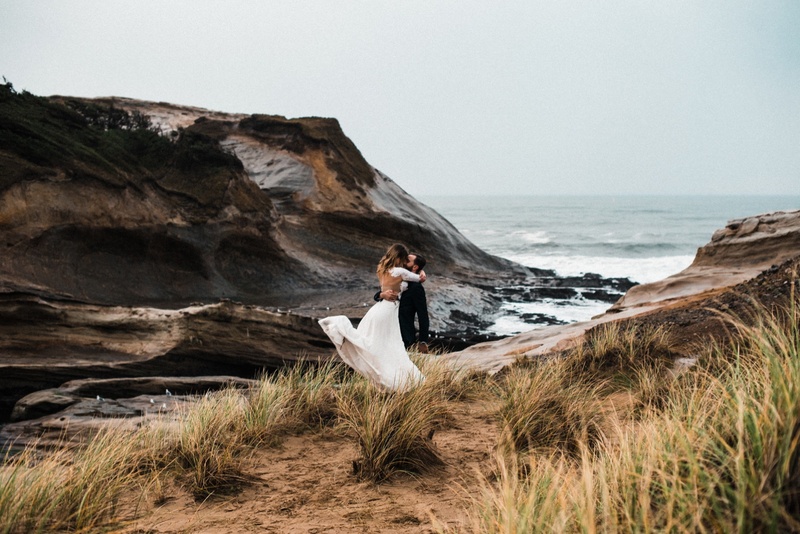 But for this Oregon elopement shoot, we chose one of our favorite spots on the Oregon coast, Cape Kiwanda. 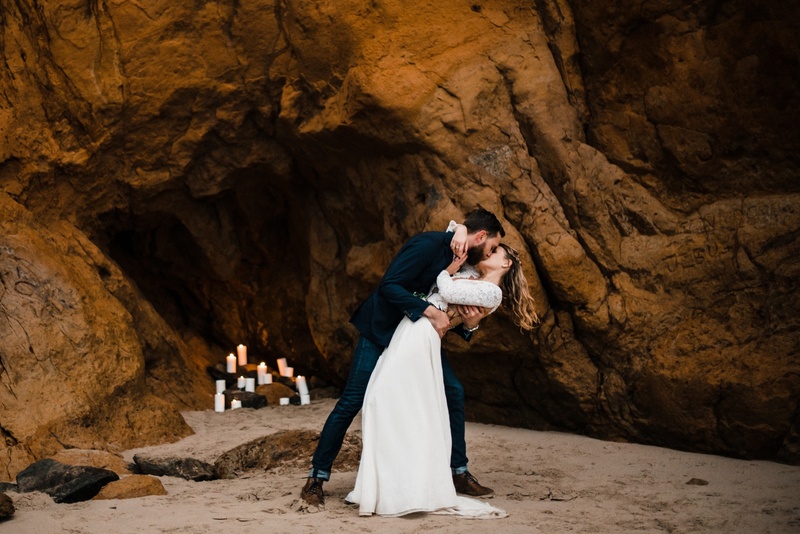 With this shoot, we also wanted to show how unique lodging can really add that extra special touch to the elopement. 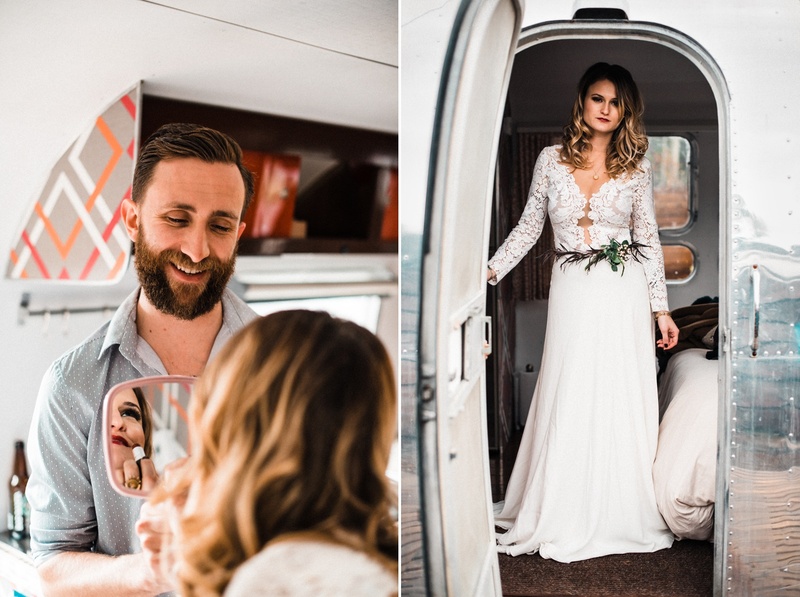 The vintage Airstream campground across the road from the beach was the perfect spot for getting ready. 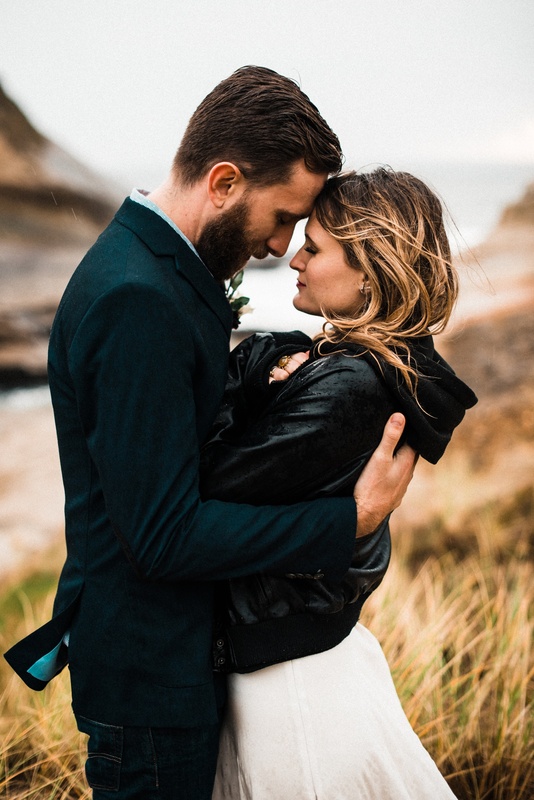 Oregon elopement planning is hard. Why? 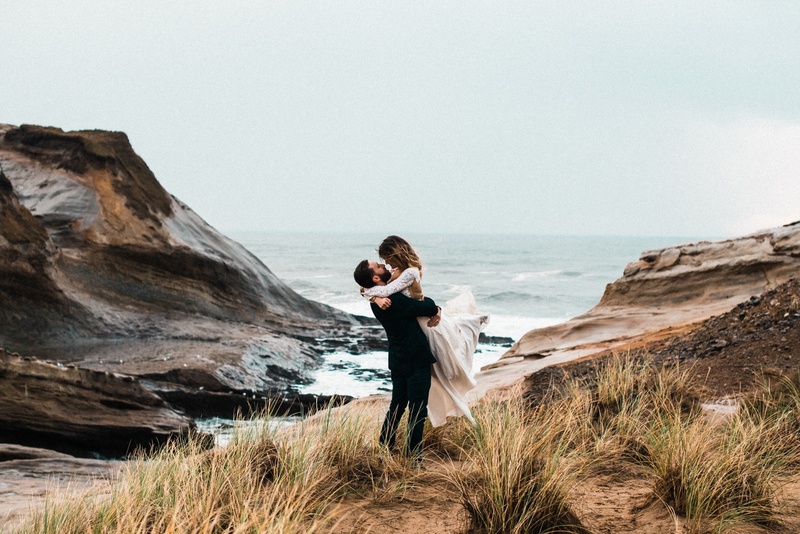 Because there are so freakin many gorgeous places to elope in Oregon! 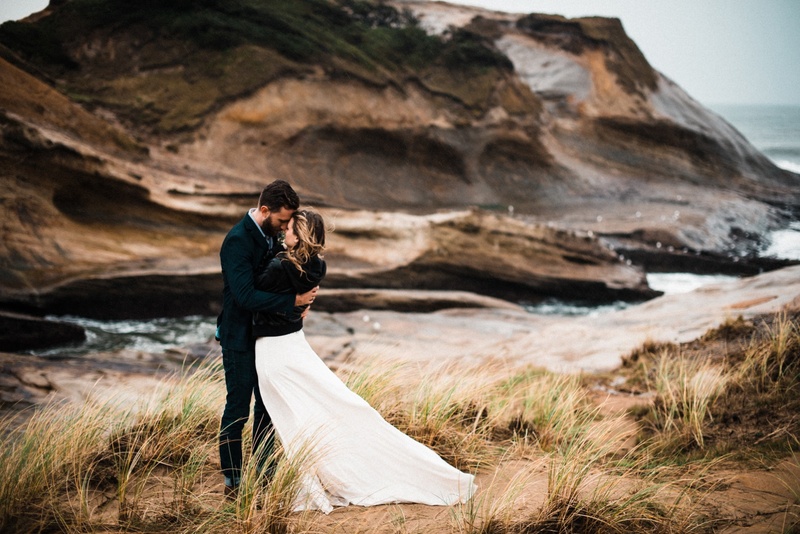 But after some grueling decision making, we chose one of our favorite spots on the Oregon coast for this Oregon elopement inspo shoot, Cape Kiwanda. 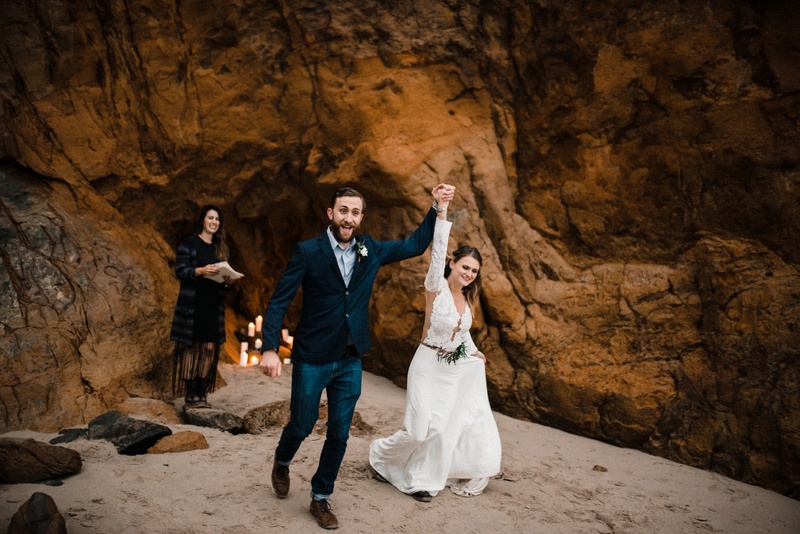 With this elopement, we also wanted to show how it’s not only about a stunning location – unique lodging can really add that extra special touch to the elopement. 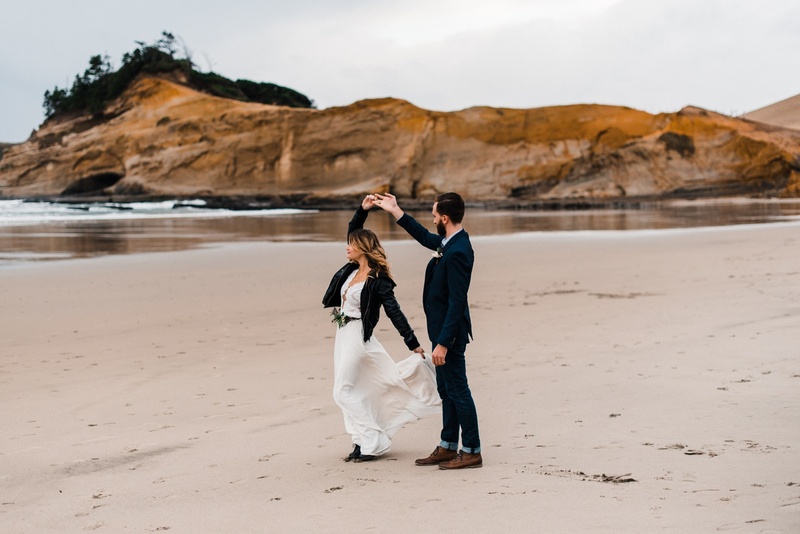 As soon as we learned of the vintage Airstream campground across the road from Cape Kiwanda, we knew this was the place to go. 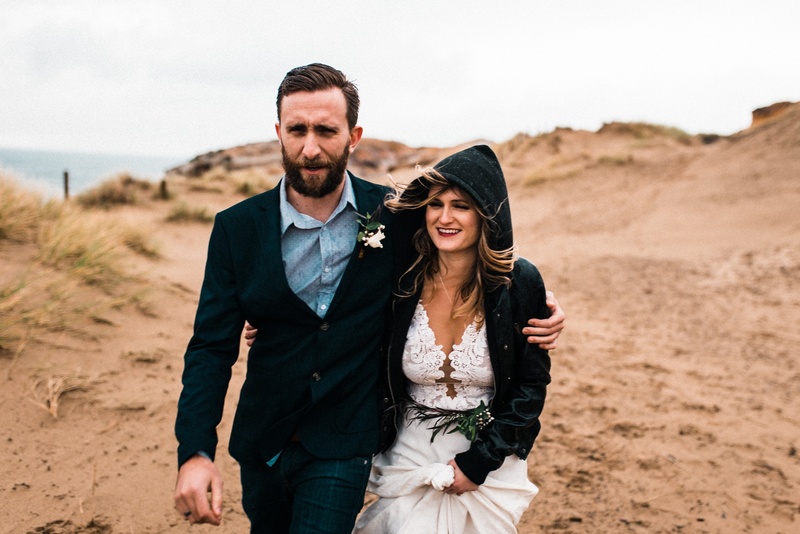 We took a gamble with the weather. 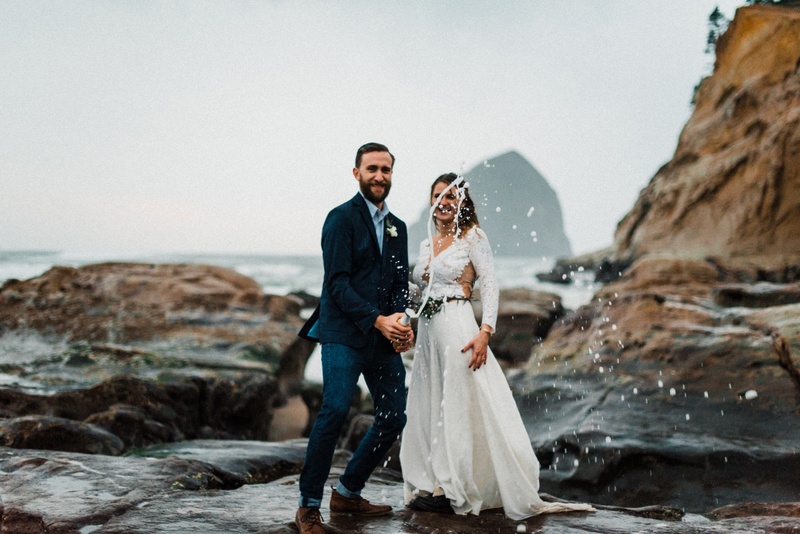 The Oregon coast in the middle of November is typically wet, chilly, and windy. 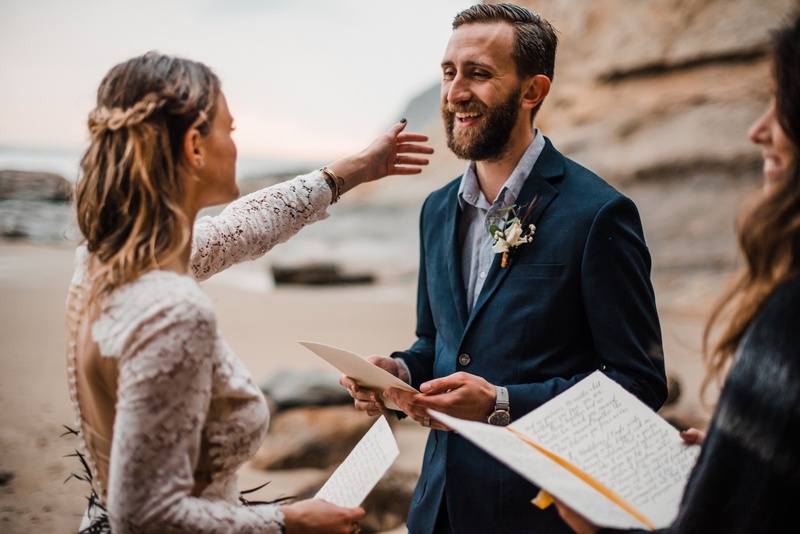 Well, big surprise, it was all three of those things on the day of our shoot. 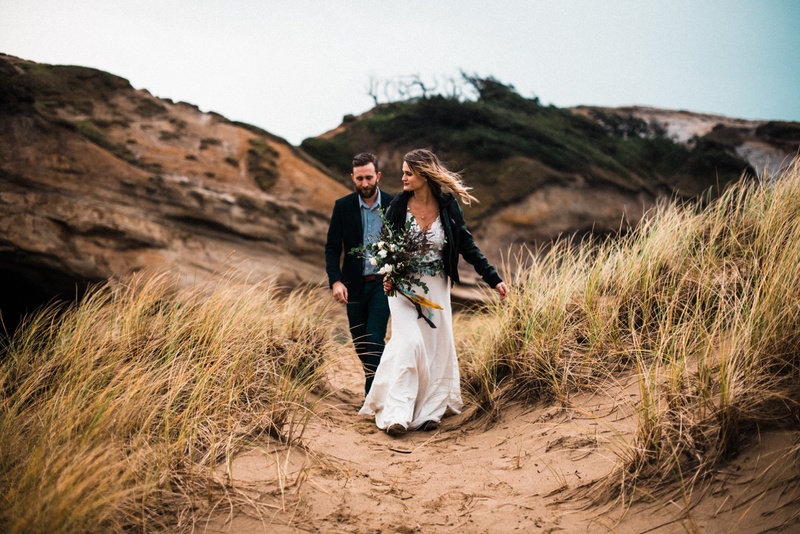 But weather is always an unpredictable force you have to deal with at elopements. 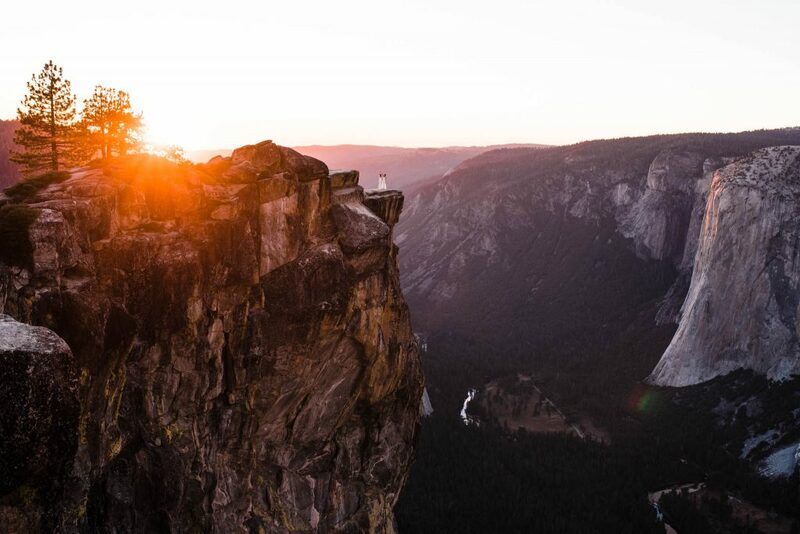 The best thing to do is be prepared for it and even embrace it. Wild weather can make for some really fun photos! 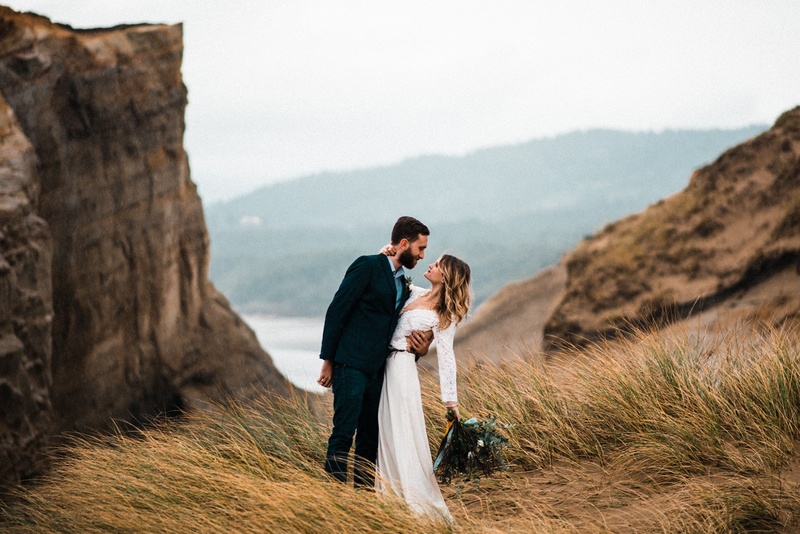 But fortunately, the rain held off for most of the day and this Oregon elopement inspo shoot was everything we hoped for. 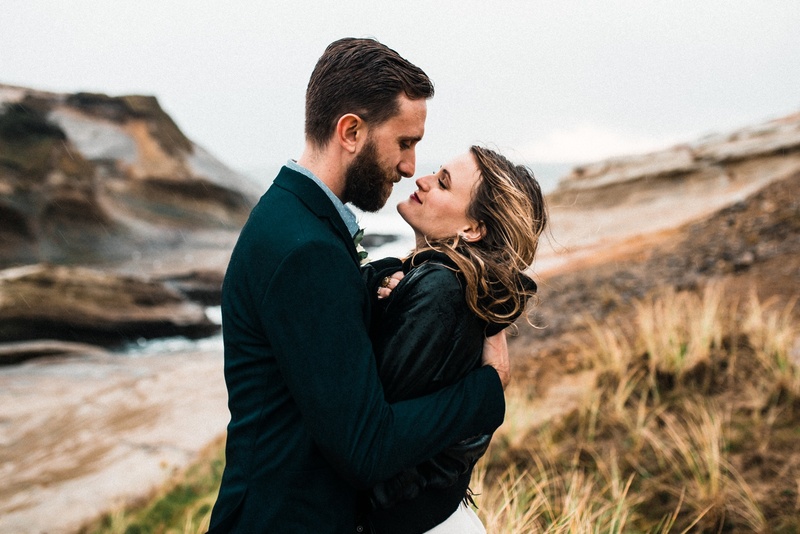 With this styled Oregon elopement, we really wanted to show the range of photos that we capture during an adventure elopement. 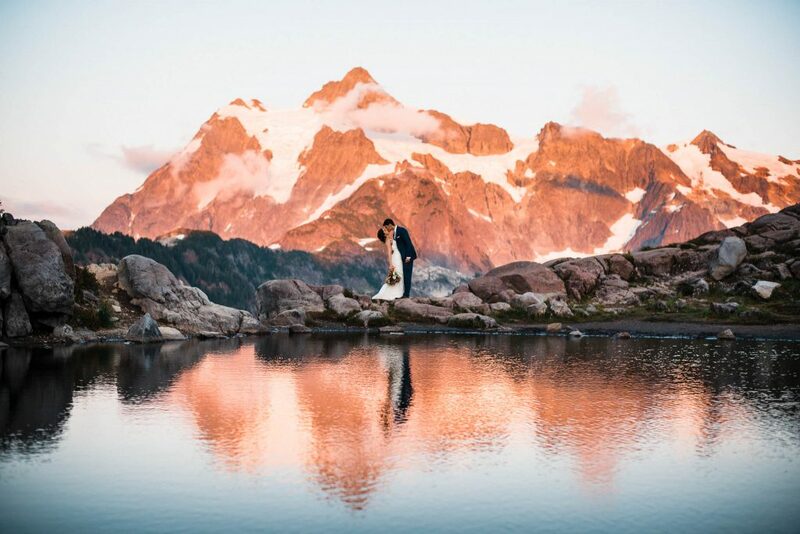 It’s not all about the epic landscape photos. 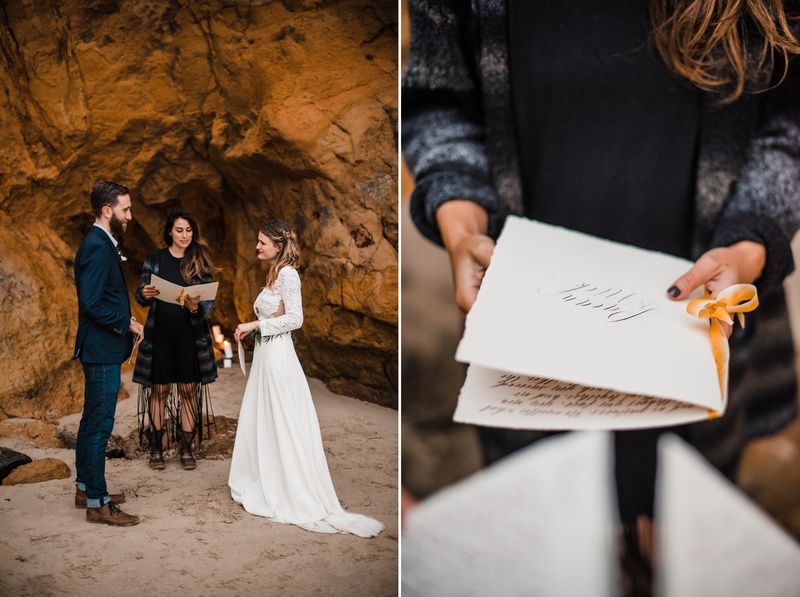 We love starting things off wherever the couple is getting ready so we can tell the full story of the day. Sometimes, especially when family and friends are around, we take a more candid/photojournalistic approach to this part of the day. 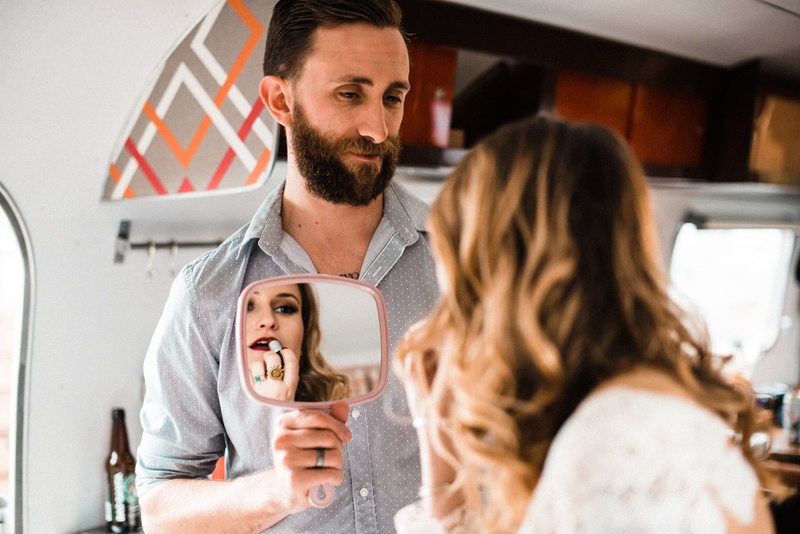 But since it was just Nick and Paean, we did a mini-session with them in the Airstream and these ended up being some of our favorite shots from the whole day. 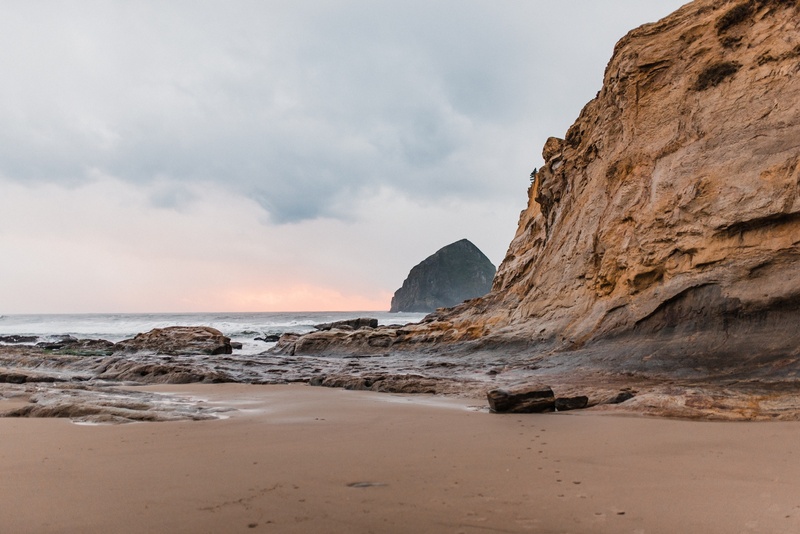 After hanging out and getting ready in the Airstream, we made the long drive across the street to Cape Kiwanda. 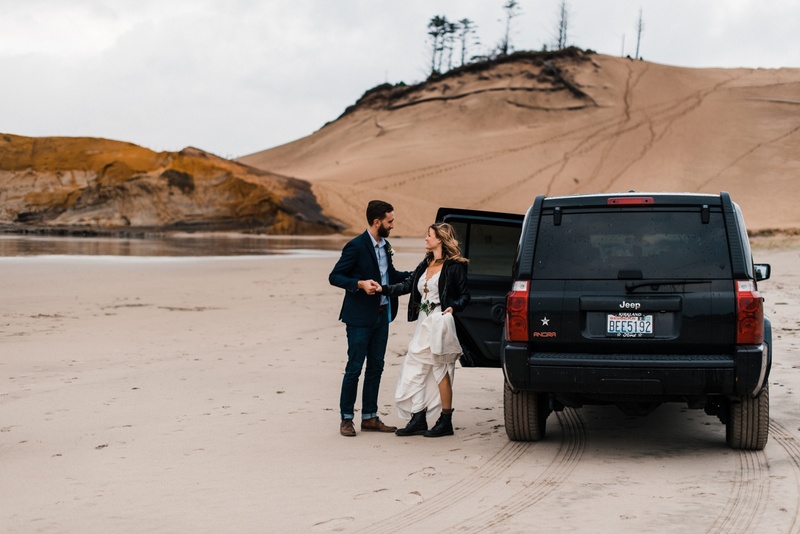 In Oregon, you’re allowed to drive on the beach, which is always awesome. 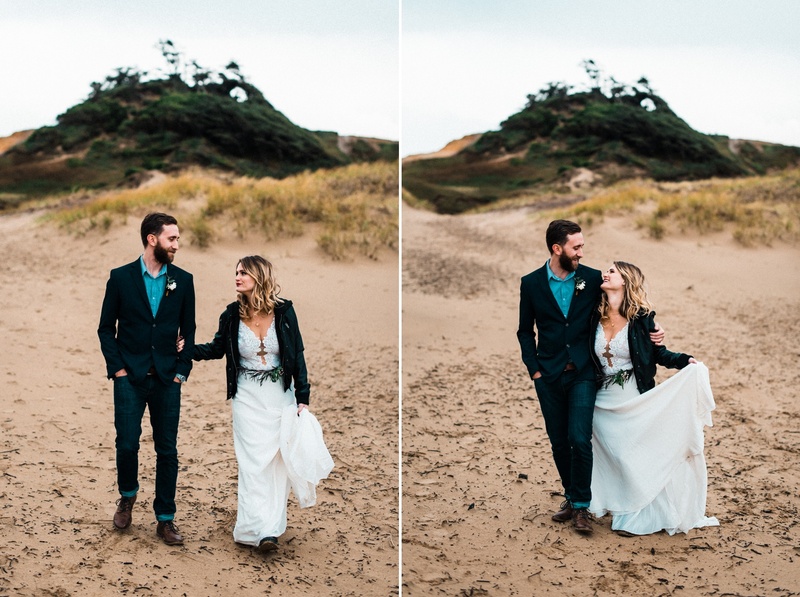 While Erika (of The Greatest Adventure Weddings & Elopements) set up the ceremony site she had designed for the day, we went on a little adventure with Nick and Paean up the sand dunes. 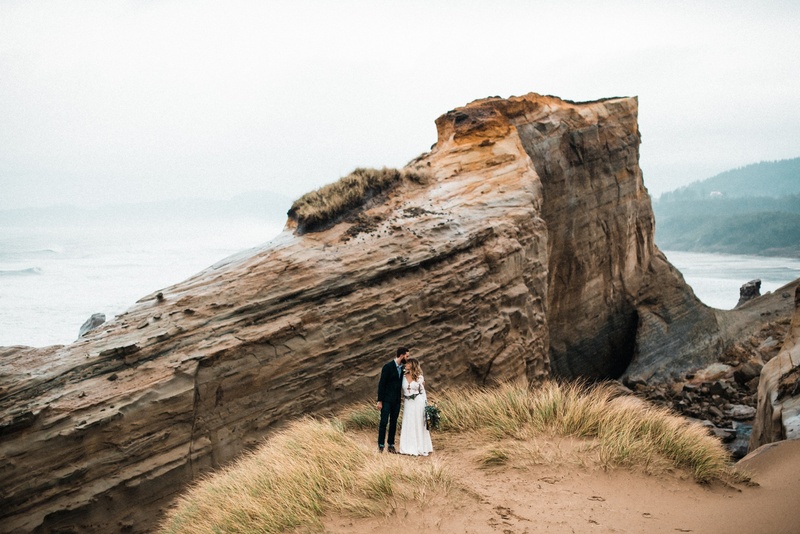 We can’t put into words adequately just how impressive and beautiful this stretch of Oregon coastline is, but the pictures do a pretty good job. 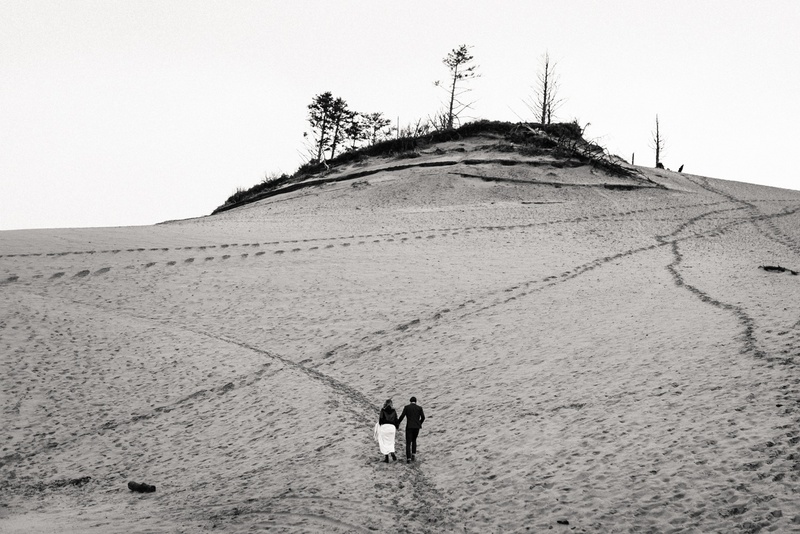 There’s a reason so many Oregon elopements happen here. Soon the rain started to move in though and things got wet and chilly fast. 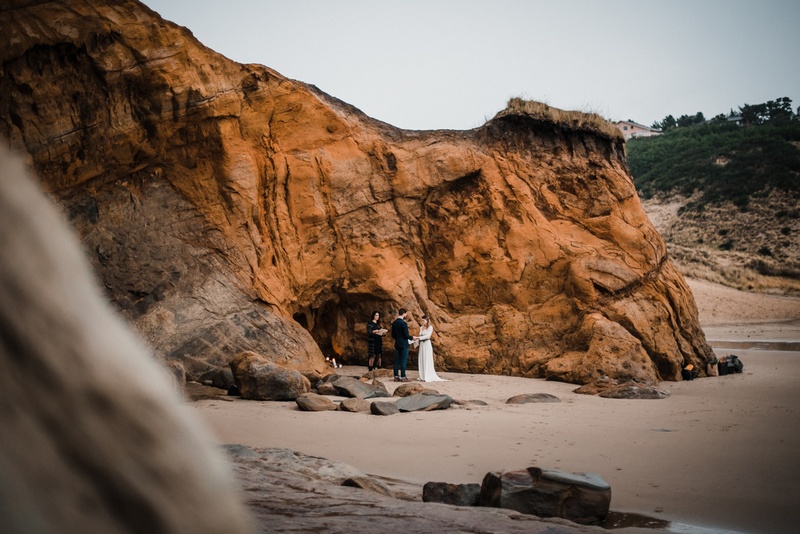 So we hustled down the dune to the area we had picked out for the ceremony, a warm cove by the water with a backdrop of rich, red rock. 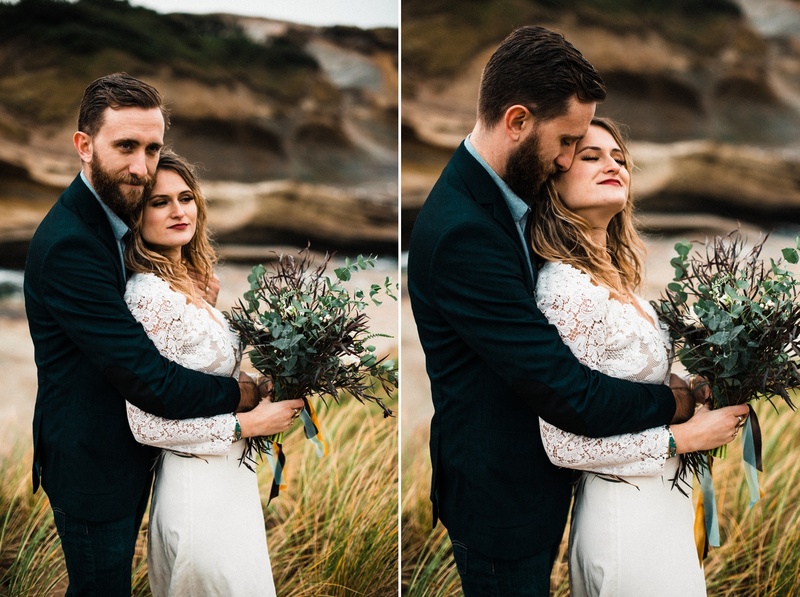 And we were surprised to find that Erika had somehow managed to light the candles, despite all the wind. Master candle lighter right here. 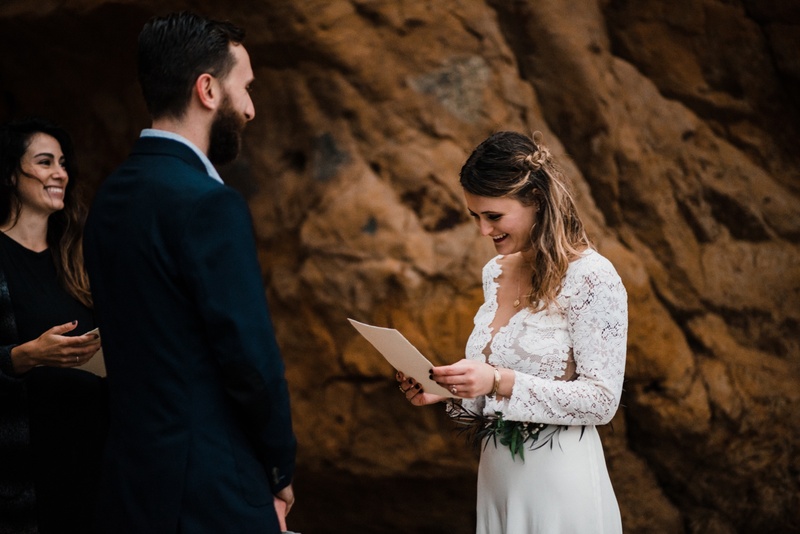 Side note – Erika is not only a wedding and elopement planner – she’s also ordained and can officiate elopements, which is an awesome package for anyone looking to elope. 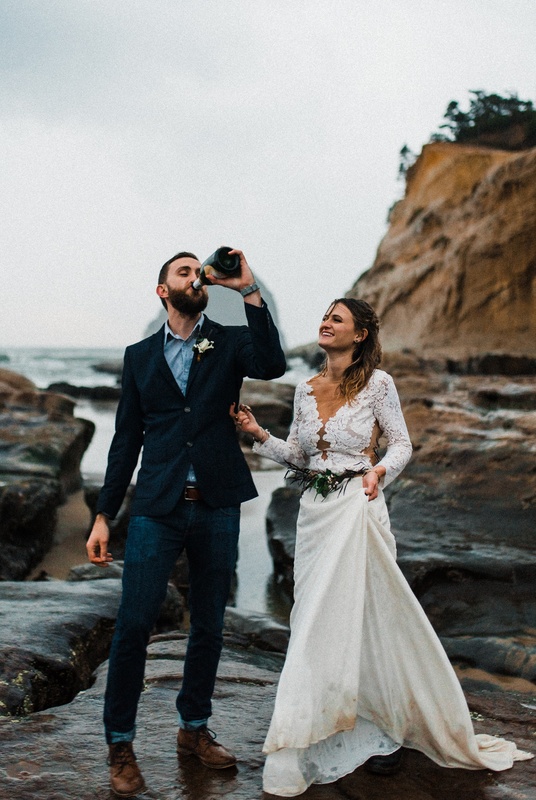 After we shot the ceremony, we wrapped things up like any proper elopement should – popping some bubbly. 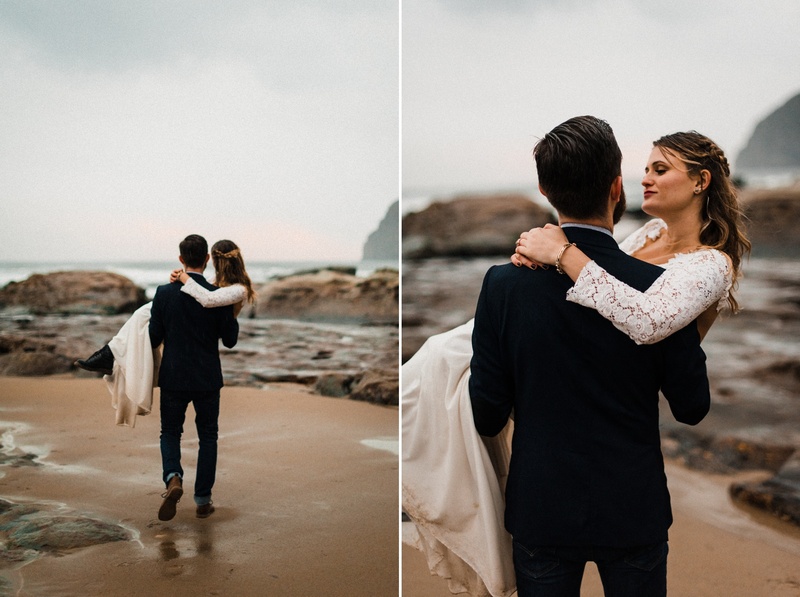 And even though the weather turned a little bad towards the end, we embraced it and the couple embraced it and we all had a blast getting wet out there. 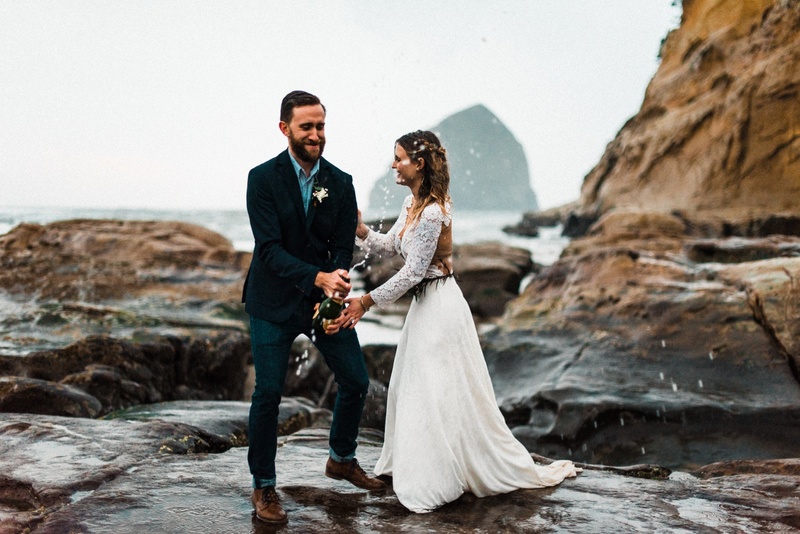 It’s a good example of why we shoot “rain or shine.” Weather is always going to be unpredictable, but if you’re prepared for it and up for a little extra adventure, it always ends up being fun no matter what. And the photos speak for themselves. 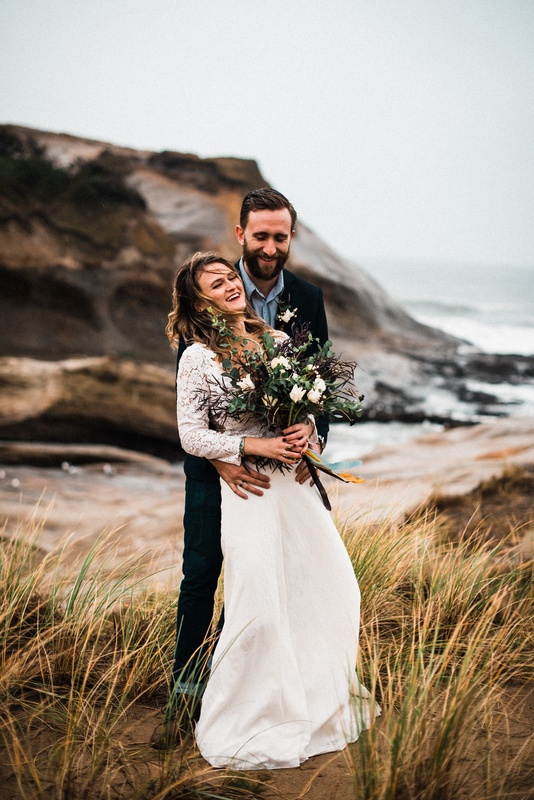 Such a fun Oregon elopement shoot! 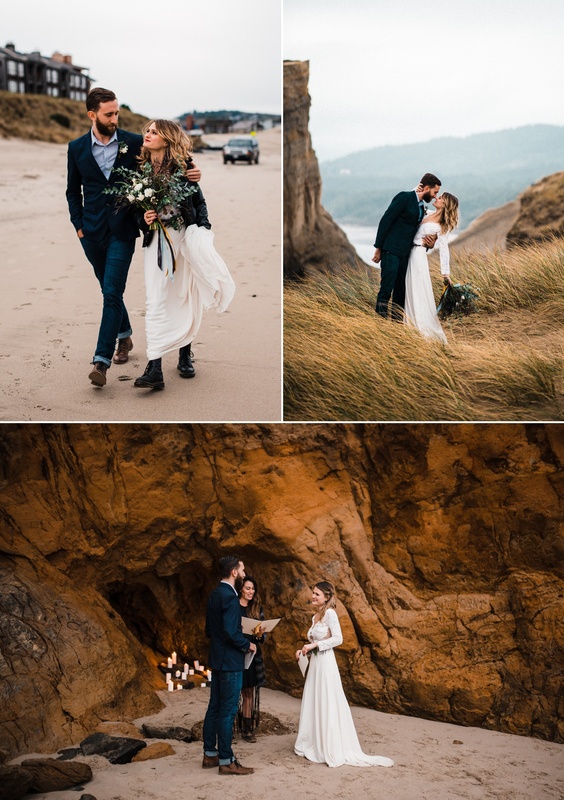 A lot of talented people came together to make this styled Oregon elopement as close to the real thing as it gets. 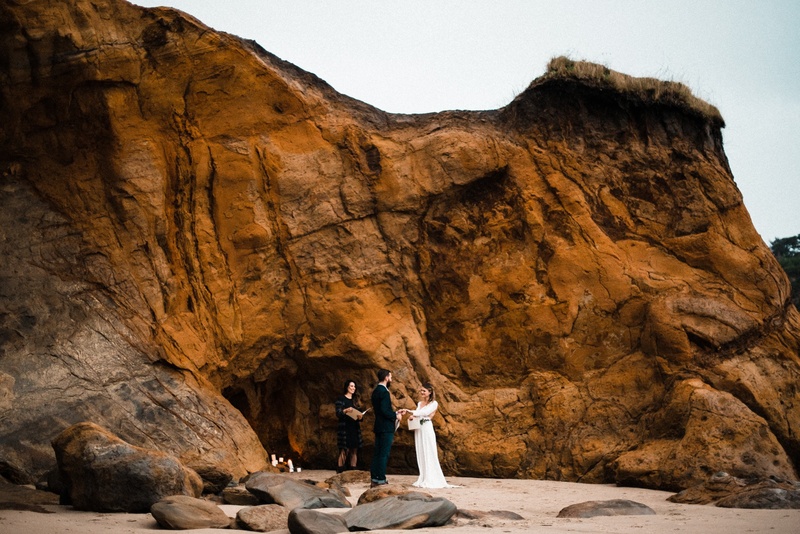 We highly recommend all of these people for your elopement! 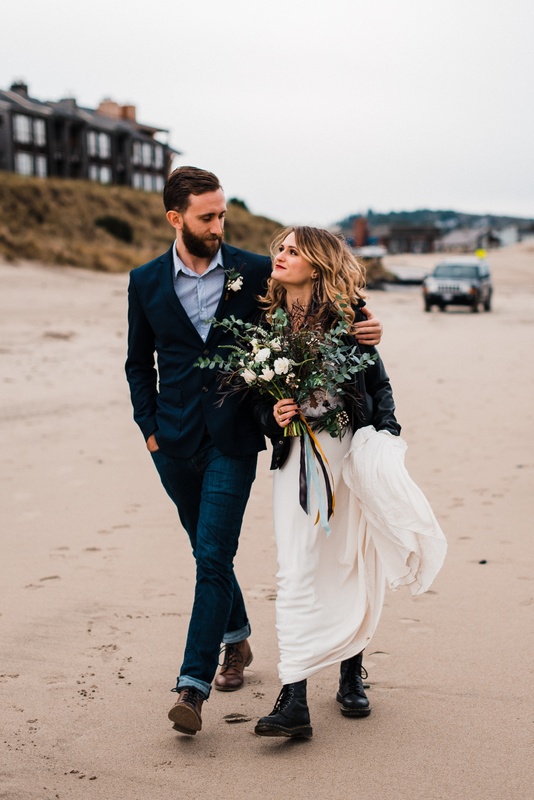 Seriously love this Oregon beach elopement and still can’t believe it’s a styled shoot! 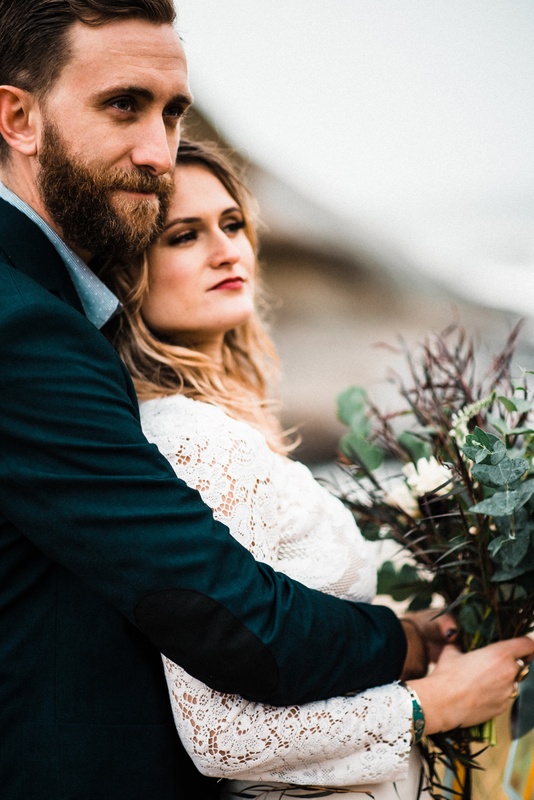 You captured such a hip, cool couple in a beautiful way! 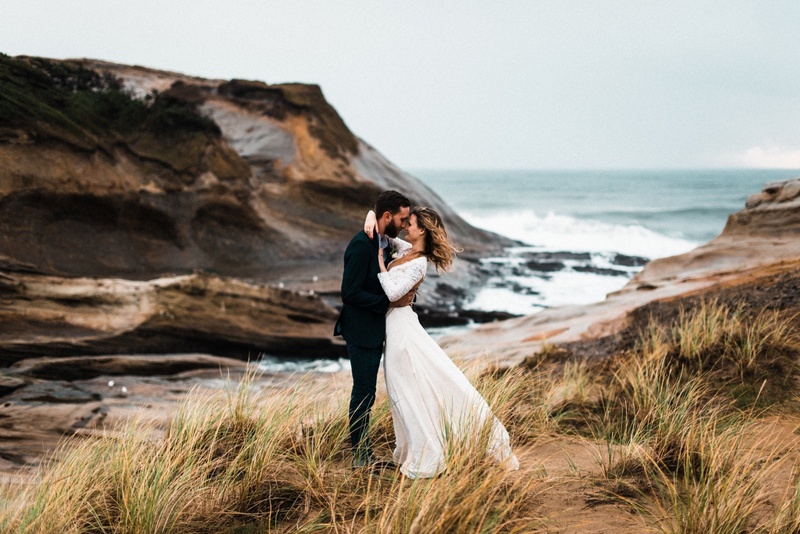 It has always been a dream to photograph an Oregon Elopement, and these photos make me want to even more!! 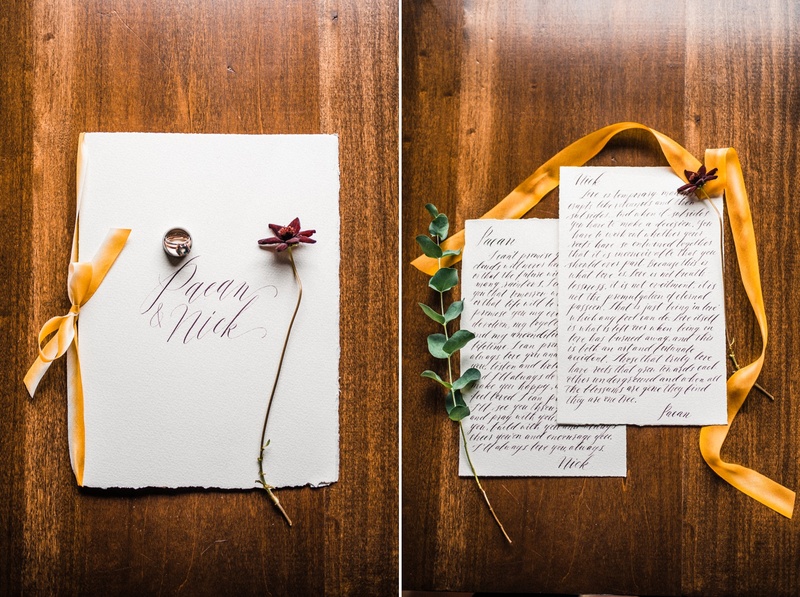 You did such a great job with this styled shoot, and if you hadn’t told us I would have never known! 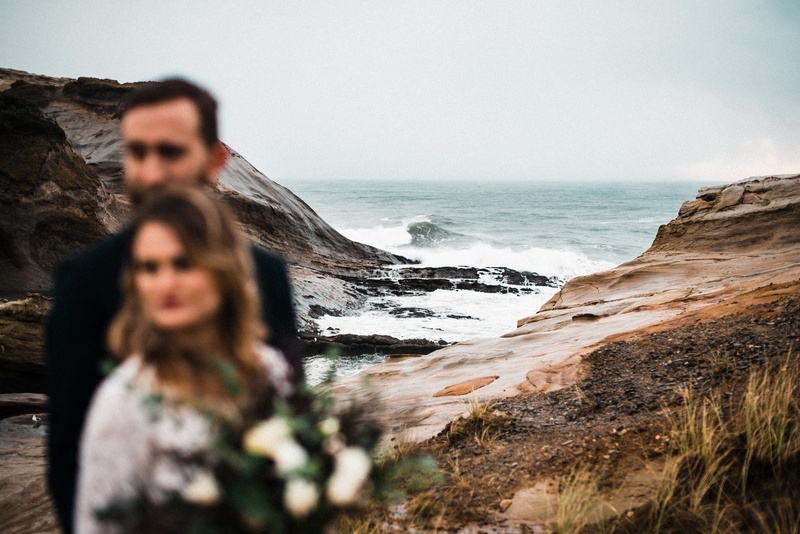 This Oregon coastline elopement is INSANE! 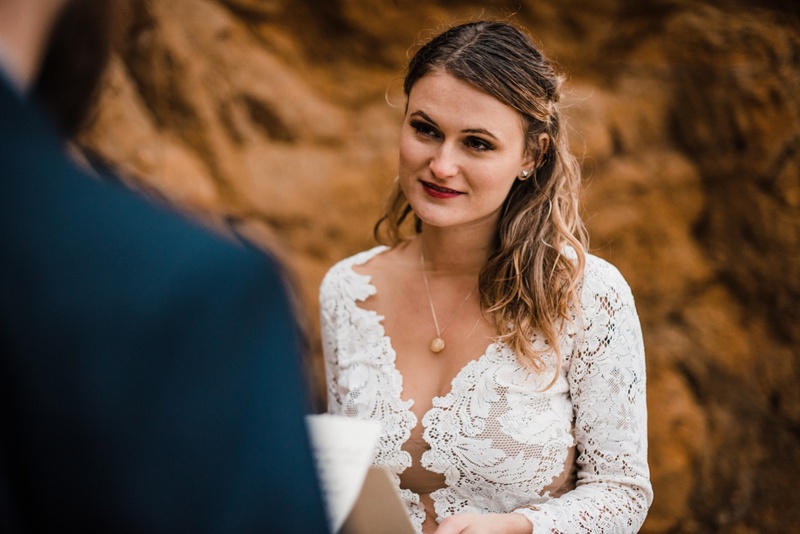 I can’t believe how gorgeous. 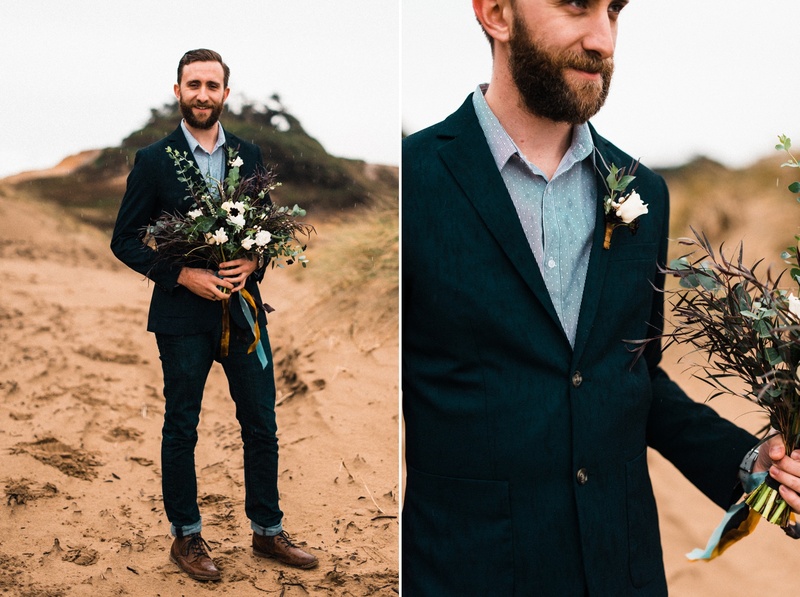 Styled shoot goals! 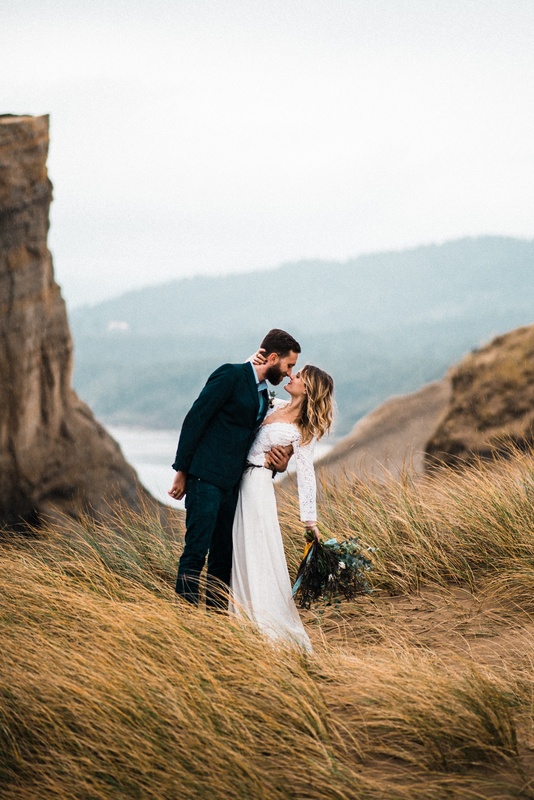 This Oregon elopement is an actual dream! 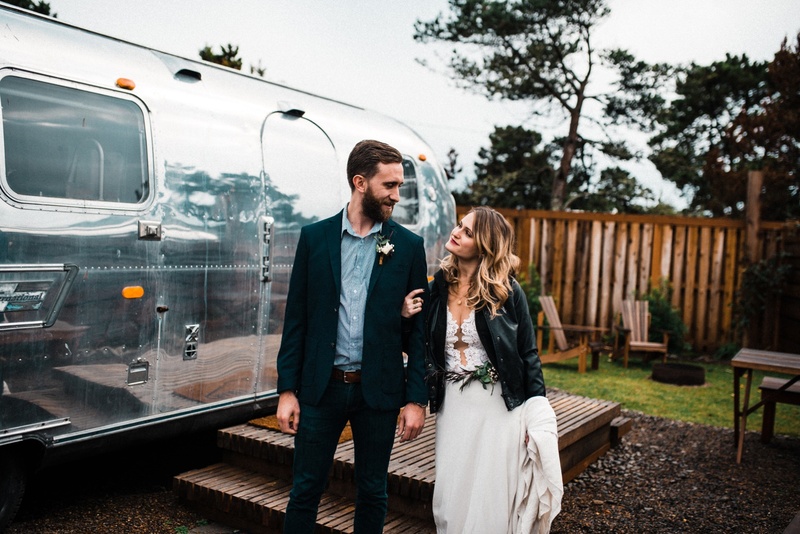 I want to travel around in an Airstream! 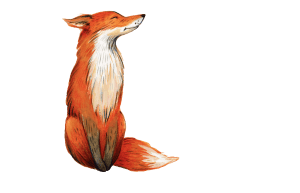 So gorgeous, what wonderful work. I’d say they picked a good spot! 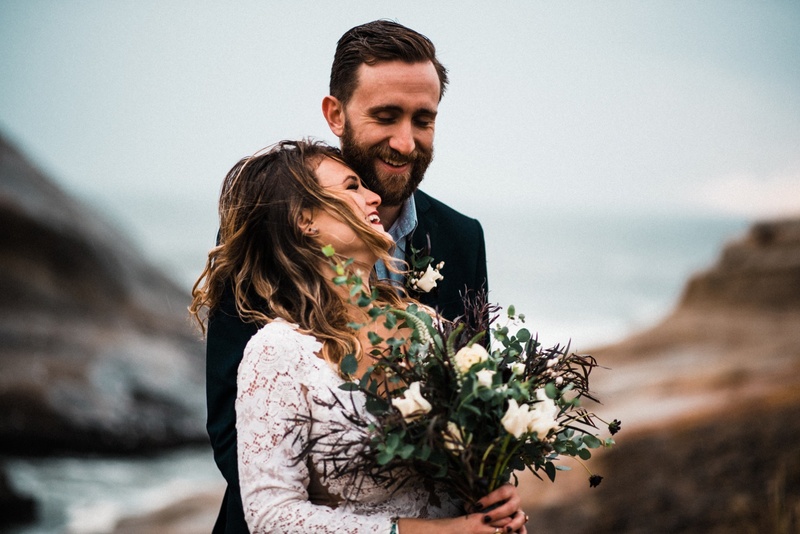 Get outttt, this elopement is so dreamy! 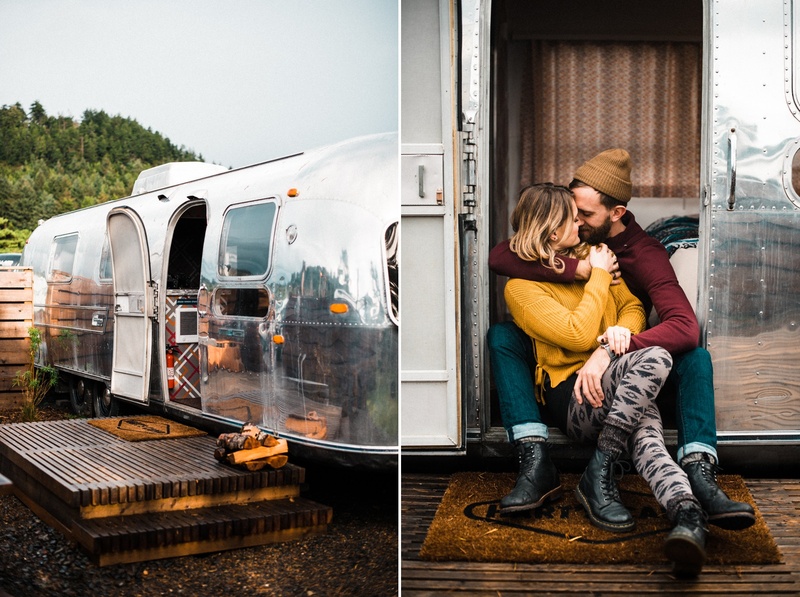 I’m peanut butter and jealous of that airstream, goals! 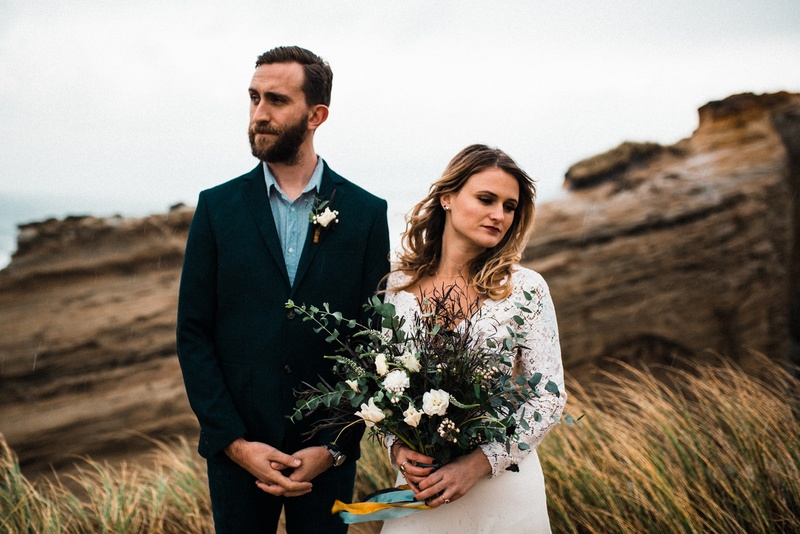 Oh my goodness this elopement is amazing. 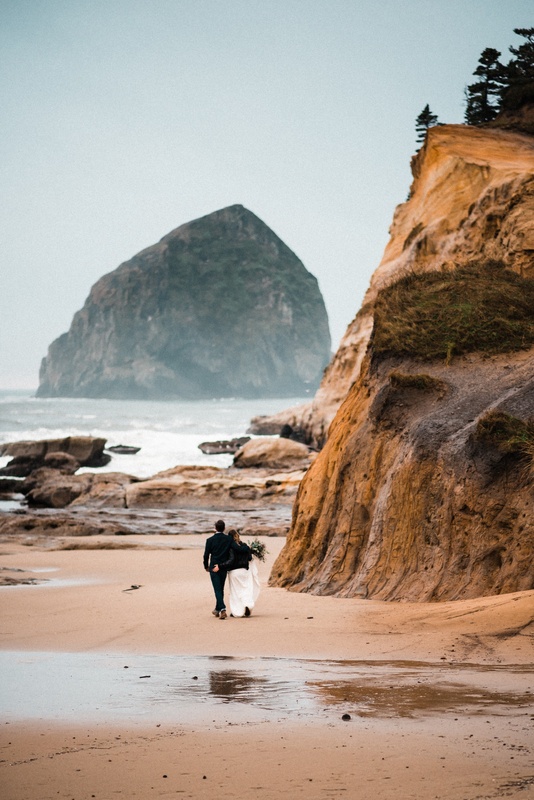 And you’re right – there’s not a bad place to elope on the Oregon Coast haha! 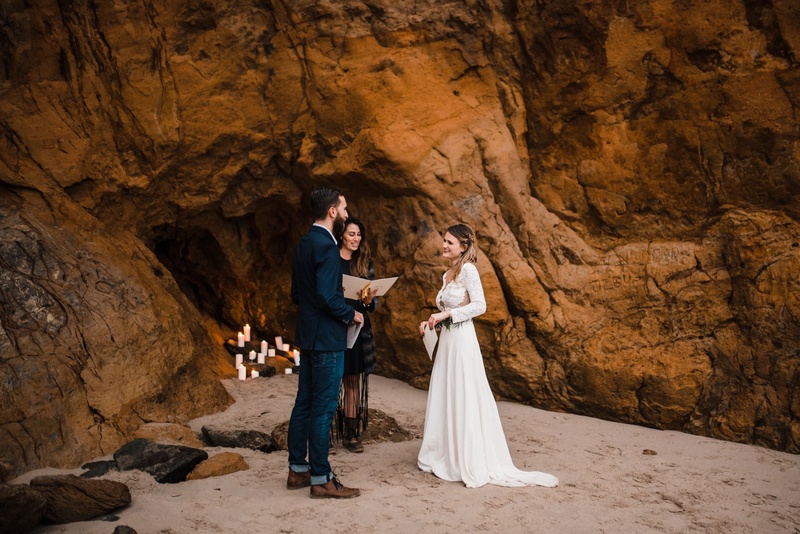 Wow, what a great example of an Oregon elopement! 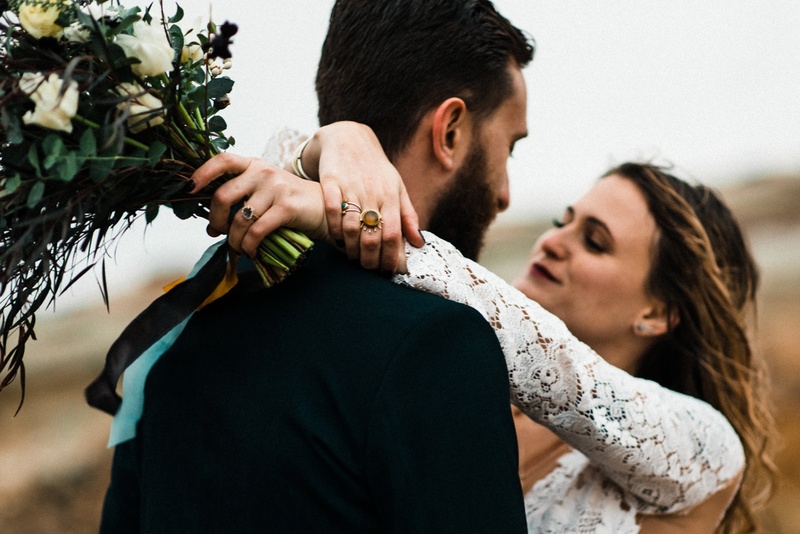 The whole thing is polished so wonderfully and I’ve never seen a belt like the bride has before! Super cool! Wow! 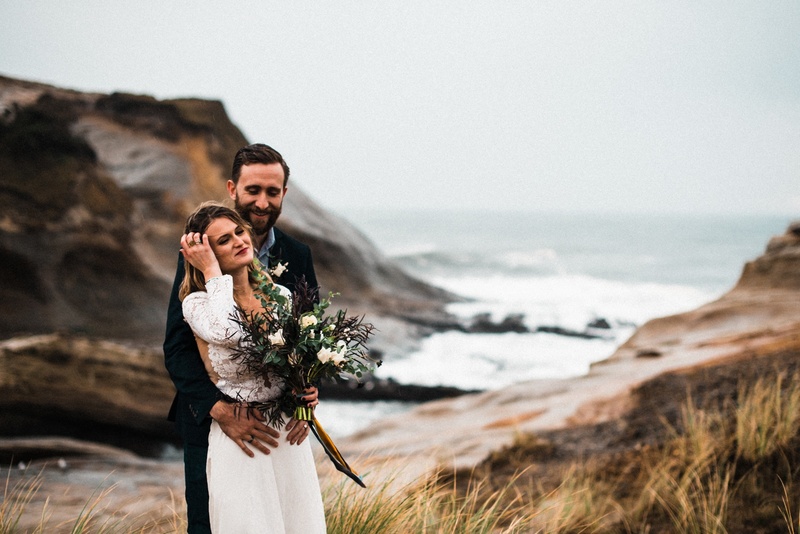 This Oregon Coast elopement is the stuff of dreams! 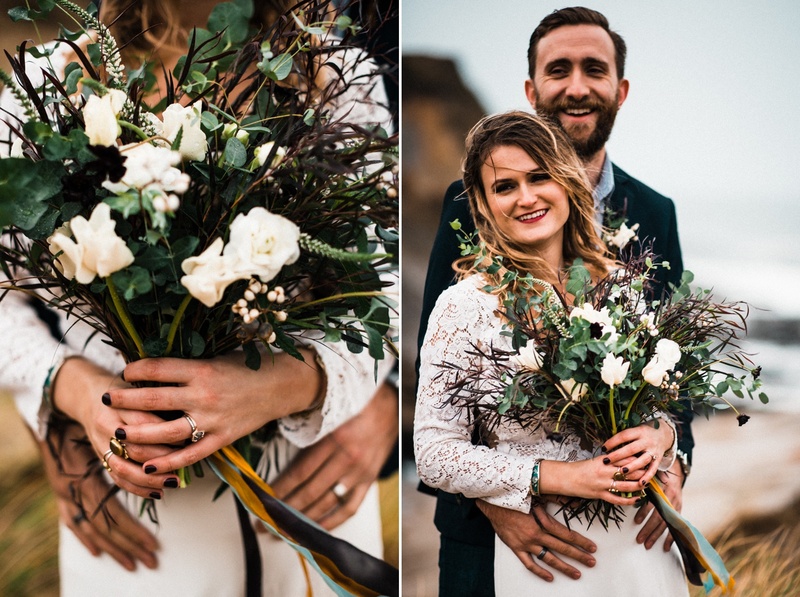 I love all the details and love the couples style! This location is so so great!!! Makes me love Oregon!!! Holy wow!! 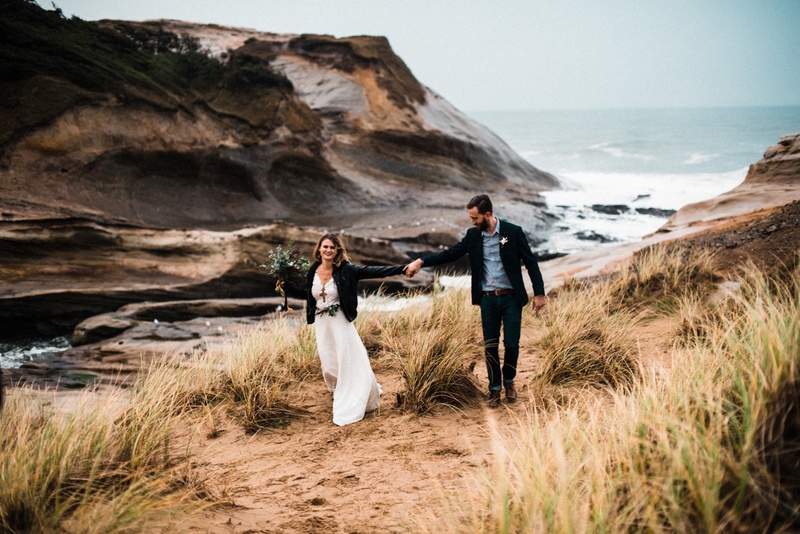 An Elopement in Oregon?! 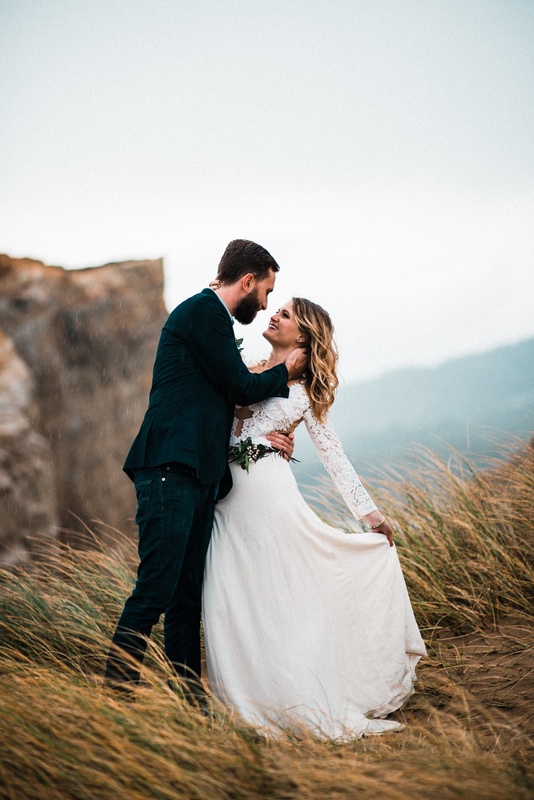 Talk about #goals! 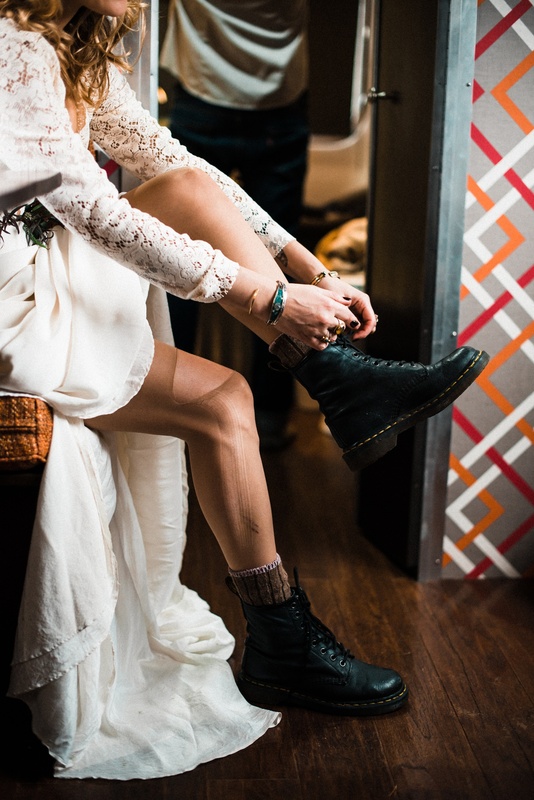 I also completely agree about the getting ready location!